The Parish and French Canadian Migrants to Compton County, Quebec, 1851-1891. GERALD TULCHINSKY, ed. — To Preserve and Defend: Essays on Kingston in the Nineteenth Century. J.E. REA. — Parties and Power : an Analysis of Winnipeg City Council, 1919-1975. Appendix IV, Report and Recommendations. MARK NATHAN COHEN. — The Food Crisis in Prehistory. Overpopulation and the Origins of Agriculture. WILLIAM M. BAKER. — Timothy Warren Anglin, 1822-1896, Irish Catholic Canadian. MAURICE MANDELBAUM. — The Anatomy of Historical Knowledge. J.L. GRANATSTEIN and J.M. HITSMAN. — Broken Promises: A History of Conscription in Canada. MORRIS ZASLOW. — The Story of the Geological Survey of Canada 1842-1972. FRANZ BALTZAREK, ALFRED HOFFMANN and HANNES STEKL. — Wirtschaft und Gesellschaft der Wiener stadterweiterung. Vol. V of Die Wiener Ringstrasse. Bild einer Epoche. Edited by Renate Wagner-Rieger. RANDALL MILLER and THOMAS MARZIK, eds. — Immigrants and Religion in Urban America. PAUL GERBOD. — L'Europe culturelle et religieuse de 1815 à nos jours. D.G. CREIGHTON. — The Forked Road: Canada 1939-1957. LUCY MIDDLETON, ed. — Women in the Labour Movement. ALISON PRENTICE. 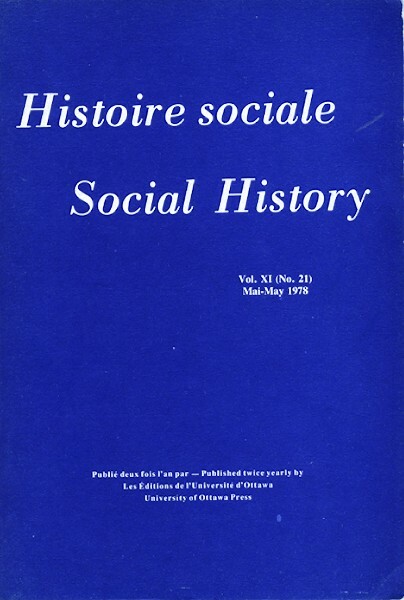 — The School Promoters : Education and Social Class in Mid-Nineteenth Century Upper Canada. GEORGE A. NADER. — Cities of Canada. Vol. II. Profiles of Fifteen Metropolitan Centres. VERONICA STRONG-BOAG. — The Parliamant of Women : The National Council of Women of Canada.